Purchasing and providing a company mobile device for an employee can be quite costly. Therefore, it is important to consider not just if you should provide a mobile device for an employee -- but also which employee should be given a company mobile device. 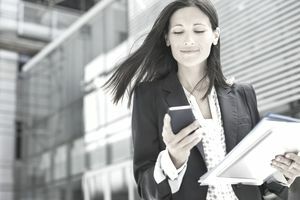 Ultimately, both of these questions can be answered by examining why an employee should be given a company mobile device. So, as the name of the device implies, a mobile device should be provided for those employees that are mobile – those that travel or are not in the office most of the time. The following is a list of considerations to help you determine if the benefit of providing a mobile device is worth the investment and if the ROI is warranted. Examine the role that the employee has in the company and how often this individual is in or out of the office. Business Development and Sales personnel should be spending the majority of their time with customers and partners. As a result, their roles in the company point to their need for having a mobile device. The mobile employee needs a computing device, whether it be a Smartphone, Phablet, tablet or laptop in order to perform the duties of the job. Sales and Executives are the most frequent employees that travel on company business. Travel may be across the country, across the world or just across town. They must be reachable in order to service customers, manage the business and make quick decisions. In today’s online culture, customers, vendors, and partners are now expecting instant responses to their needs. Being readily responsive to customer needs from anywhere, at any time will be a strong competitive differentiator. Tech support employees that are on-site may need expert information from another employee, or from experts outsider of the company. While they are at the clients’ premises and providing support, having a mobile device will allow them to quickly establish contact with the right resource. Particularly with the ability to have real-time interactions through Go To Meeting, Skype and other online meeting capabilities, aTech Support employee that has a mobile device can be invaluable and can likely complete the task or job at hand quicker – hence providing great customer support. Employees whose job duties require them to be “on call” after hours will need to be contacted quickly. For urgent situations, time is critical, and a company mobile device will help the business to contact that employee quickly. Not long ago, on-call employees were only accessible via pagers and “beepers,” but this technology has evolved to a much more efficient arrangement due to the advent of mobile computing devices, hence contributing to the efficiency of on-call employees’ productivity. With our advanced ability for connectedness, it is now practical and in fact, in most cases more cost effective to have some of the company’s workforce working remotely, or from their home. In this case, providing a company mobile device is the only way that the employee can perform their job duties. There are many ways to enable productivity for the remote worker, as long as providing them with one or more mobile devices is achieved. Warning! This should not be the criteria for selecting the employees that are provided with mobile devices. This type of subjective reward can run the risk of becoming unchecked, biased and therefore a practice that might ignite a dangerous precedence. The employees’ job duties and their ability to provide excellent customer service should be the most important qualifiers when deciding which employee is provided with a company mobile device.